As a child my family had both cats and dogs. But it wasn't until this past April that I too (as a adult) became a dog parent. Yes, you read that correctly -dog parent. Not "owner". We do not "own" our children and nor do we "own" our pets. When we have children we protect them, shelter them, feed them and raise them properly. The same applies to pets -the difference (in my opinion) is that pets give us unconditional love and friendship. Every year millions of animals are surrendered to shelters or found as strays and there is no one to blame for this terrible tragedy but ourselves. As pet parents we have been irresponsible. We think it'll be great to get a pet -but then we don't spay or neuter them -we think it'll be fine for them to roam free outside -we don't take them for regular medical checkups and/or we don't walk them daily. Sadly, many have probably made the decision to adopt a dog but did not think about the costs or time involved in parenting a pet. I honestly cannot say exactly why I (we) started thinking about getting a dog -maybe it was to balance out the cats we have -or secretly, maybe it was to put them in their place. Those little stinkers think they "own" us humans! Who am I kidding...yes, all our pets have us wrapped around their fingers. Really, though, I think it was maybe to bring another element into our lives, even more enrichment and maybe some life into our home. My husband and I do not have children (and trust me, after hearing some of our friends who do have kids...we're kinda glad) and our pets give us more closeness and love than we could have ever hoped for. So, as our talks became more serious, so did our search and RESEARCH. We were not taking this new endeavor lightly. We fully intended on finding the right dog for us and for our existing household. But we also knew, once we did make a choice it was a commitment we would never break. Therefore, it was extremely important to make an informed decision. Although we did make an inquiry once to a woman who bred pugs, as we thought they'd make a great addition. I really, really did want an all black pug -but, I just couldn't wrap myself around paying for a dog, (1) when there are so many homeless dogs; (2) so many in shelters and (3) we'd still be paying for the unknown. And sadly, today, many people use dog breeding as their "job" and that's all they think about -the money. But that's a subject for another post. For months, we continued to look up different breeds to learn at least a little something about their temperment and the breed itself. But we fully intended on adopting a shelter dog. The purpose of the research was to gain some knowledge of the different breeds should we adopt a dog that was listed as a specific breed or breed mix. It wasn't that we decided one day, I want a dog and adopted one within a week. This process took us months and months. We would go look and along the way discuss how we would handle this or that situation with the biggest factor being our cats. We didn't want to alienate them as they were the kings of the castle (all male cats except one). One day, I happened across an ad for a toy breed dog. Due to the womans work schedule, she just felt it was wrong to keep the dog in a crate all day. So, my husband and I had met with her. Again, not sure why we even inquired as it just wasn't in me to purchase a dog. But we met with her anyway, loved the dog, cutest little button. But of course, she paid full price for the dog (which she said she got from a breeder in another state). When we had left I had stated that we both loved the dog (named LuLu) but I just couldn't morally pay that amount of money, especially knowing how good a home she would be going to and that there were so many homeless dogs. I said, at most, I'd pay X amount and even then I wasn't feeling good about it. Well, a day or two passed and as time went on part of me hoped she either wouldn't call or that she'd call and say she chose another family (this way, I wouldn't have to say, I've changed my mind that I just can't pay for a dog). The other part of me wanted her to call because we did fall in love with LuLu. Well, we did get her call. She called me at work one day and was very apologetic but said she just couldn't part with her dog. She said she had a moment the night before and just couldn't let her go and that she was going to try and work it out with her family. I completely understood. I felt relieved and sad at the same time. But thanked her for calling and wished her the best. I think this call came on a friday. That following Monday or Tuesday, don't recall specifically, I was off work and happened across the website of one of our local shelters. I found they had two miniature pinscher mixes and decided to go meet them. Strangely, of the two I wanted to meet the one they named Lou Lou -yes, the same name as the dog we just "lost". First impression, sweet, a tad high energy but I figured it was also because of all the excitement being out of the cage, etc. We did a kitty test by introducing her to the resident cats and the dog could care less. So I asked that she be held until my husband could meet her. The next day, we both went down there and Lou Lou was even more excited, still very sweet, and very kissy! My only concern was that I didn't like her "face jumping" as I called it. You see, I was bitten as a young child, by a little white fluffy dog. But it was my fault. I had no right to approach the dog (who was on a lease in the front yard) and my brother even told me not to. I thought, oh no, she's soooo cute, she won't bite. Wrong. After getting some stitches and an eye patch, all I have today is a little scar near the eye. Am I afraid of dogs -NO. Just more careful and respectful of them. But, I will say I am not a fan when dogs jump at my face. With Lou Lou, I realized it wasn't meant to be a defensive action, it was just her way, something she learned or wasn't taught properly and figured of all the things that could be an issue, we could train her to stop. We were told she was a stray they picked up and they had no prior info on her other than she passed the behavior tests. We had her put back in her cage and we talked in the hallway. While we talked I peeked around the corner (she was in the first cage) and there she stood as close as she could get to the door, with her cute little flippy ears pearked up and big eyes staring at me as if say, "I love you, don't leave me". We left having completed the paperwork to pick her up in a few days after she was spayed. The day before picking her up we went "puppy" shopping -new harness, food bowl, food, toys, etc. We were so excited. While in the store, we get a call. It was the woman we met with for LuLu. She apologized for calling again but after a week realized that although she loved her dog very much she just couldn't give her the play time she deserved and would be happy for us to have her. In the blink of an eye I was happy, sad, angry and frustrated. I explained our story -we just adopted a dog...ironically, named Lou Lou....we love her dog but we've made a commitement...and we are not ready for two dogs...we don't even fully know how our new dog will integrate with our cats. The call was bittersweet. She understood, apologized and said if we changed our minds to please call her. Our drive home should have been a happy one -there was silence and sadness. And I cried. 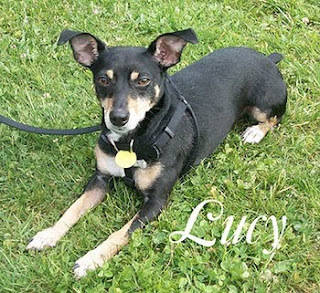 We arrived early the next day at the shelter to pick up Lucy (we decided she wasn't a Lou Lou...well, maybe she was...but we instead chose to name her Lucy). It was a chore getting her harness on but we came prepared with two different sizes since we didn't know which she'd fit and the technician helped us get the harness on. We decided to walk her in the park across the street before getting in the car -good thing we did. Lucy was in high gear, lots going on, super excited and she had to have pooped at least six times! While shopping the day before we got Lucy a squeaky toy -we call it red dog (RD). We gave her this red dog in the shelter and from that point forward -she would go nuts if her red dog wasn't near. It was like her comfort toy and we've actually acquired a graveyard of red dogs! She will tear them a little but she sooooo loves her RD!! She does have her quirks, one of which is that she does not like the noise a camera makes or the flash. So getting a picture of her is hard but my sister in law got this great photo while she relaxed on the lawn one day. Thanks Dawn! You will get back triple and more than what you invested to find your perfect pet! PS The big question. Does she get along with our cats? Yes....for the most part. She can have that drive to chase them...it's her breed. But do we allow her? NEVER. We correct her immediately upon seeing her face. She will have a certain fixated stare if she is going to chase them. And we've found it's usually not to hurt them, it's to play with them (which they don't get cause she's a bit bigger than them!) or to get them away from us (she thinks we're all hers!). In the end - A VERY HAPPY STORY! Remember, adopt a shelter dog and save a life! What a heartfelt post! Lucy reminds me of a dog we had when I was a child. Same coloring. We called it Blackie. I'm so glad that Lucy "found" you.